On assignment with feature writer Alex Shoumatoff for the Smithsonian, we’ve "come to Borneo to camp with a group of Penan hunter-gatherers who live the way their ancestors did, in raised huts that they throw up in no time at all, hunting with blowguns and moving every few months to a new encampment. Of the 10,000 or so Penan on Borneo, only several dozen are still semi-nomadic." "Timber companies fell the ancient trees and export their wood, mostly to other Asian nations. The palm oil industry follows closely, clearing the land for enormous plantations. 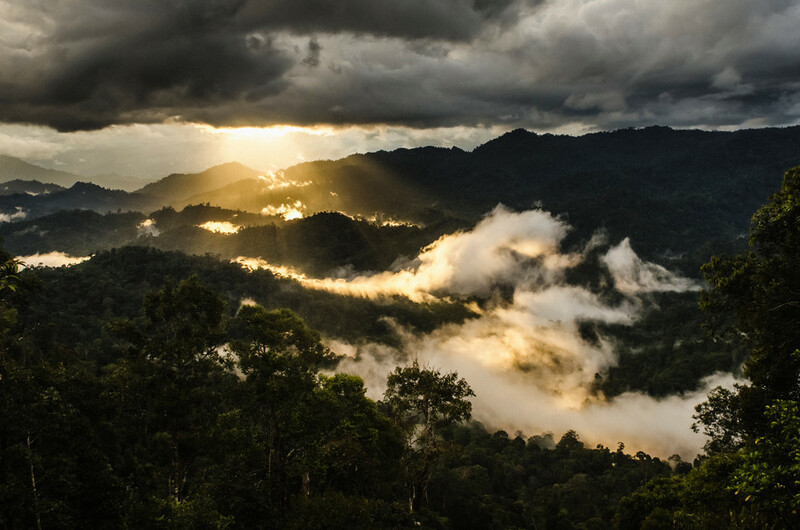 Ninety percent of Borneo’s primary forest cover is now gone, along with some of the tallest tropical trees in the world. In their place, much of the island is now covered with a tossing ocean of oil palm trees. The oil they produce goes out to markets in the United States, Europe and just about everywhere else: It’s an essential ingredient in processed foods, baked goods, ice cream, cosmetics, cleaning agents, biodiesel, toothpaste, shampoo and countless other products."